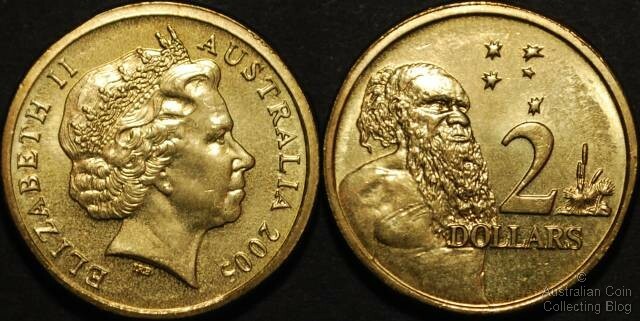 The Australian two dollar coin was introduced on 20th June 1988 replacing the $2 note that was withdrawn from circulation. As with the one dollar paper note, the $2 note had a short service life and replacement with a coin was very cost effective. The Australian 2 dollar coin standard design is that of an Aboriginal elder and was the only design used until 2012 when the Mint began a run of commemorative $2 coins, some with colour printing. In 2012 the Royal Australian Mint produced a Remembrance 2 dollar coin with a coloured red poppy design and also an uncoloured type. 2013 was the 60th anniversary of the Queen’s coronation so a purple striped $2 coin was minted and in 2014 a green coloured 2 dollar coin, again for Remembrance, this time with a dove with an olive branch in its mouth and circular green stripes. Adding to this a red Lest We Forget ANZAC coloured 2 dollar was struck in 2015. The $2 coin is smaller than the dollar coin at 20.62 millimetres but a fatter little coin with interrupted reeding on it’s edge. This width and the different reeding is to help those visually impaired distinguish the difference between it and the dollar coin. It’s comprised of 6.6 grams of 92% copper, 6% aluminium and 2% nickel. The standard reverse design is of an aboriginal elder designed by Horst Hahne. Mr Hahne used his own adaptation of a drawing of an aboriginal elder, Gwoya Jungarai (1895-1965) nicknamed One Pound Jimmy depicted by artist Ainslie Roberts. The coin is not meant to feature anyone in particular, this was just the inspiration the designer used. For the first 2 years of issue only (1988 and 1989) the designers initials HH appeared on the reverse. For all other years following it was removed. The coin also features the southern cross and native Australian flora the grass tree. The obverse differs slightly with the varying effigies of Queen Elizabeth II over the years. It was first issued with the Raphael Maklouf effigy until 1998, then the Ian Rank-Broadley design from 1999 onwards. Interestingly in 2006 the fine silver proof year set featured the $2 coin with the original Arnold Machin portrait of a young Queen Elizabeth II celebrating 40 years of decimal currency. This was the only two dollar coin minted to feature this obverse. If you’re checking your change you may notice some slight variations with the size of the font and the Queen’s head on different years. These are known as large head or small head varieties. Some low mintage years to look out for are 1993 and 2000. There have been some counterfeit examples of the $2 coins found dated 1998, 2002 and 2003. On close inspection these are easily recognizable as fakes. The Queens hair and also the aboriginal elder design are clearly of poor quality and roughly designed. Remember trading these coins is against the law even if you are given one in change.